Depth: 6" x Width: 9" x Height: 5 1/4"
Beautiful fully locking jewelry box with tasseled key and full mirror! Modern Lines, Cream Colored, Lift Lid with Full Mirror, and removable lined tray. 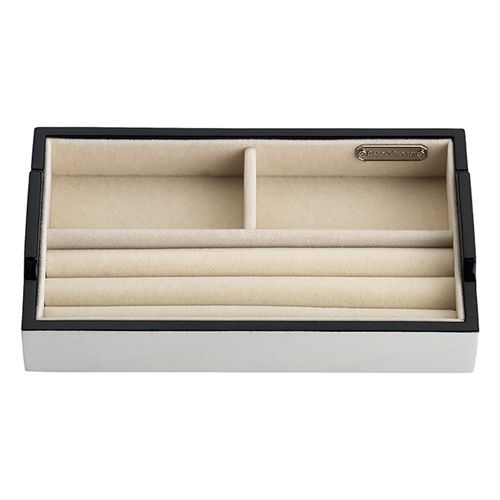 Perfect for keeping your jewelry treasures safe, secure, and out of sight. This jewelry box sits atop the dresser without a hint of what lies insides. Measuring 9" x 6" x 4 1/2", this will be an unobtrusive addition to the room decor. please contact customer service for assistance with a warranty claim. satisfied, please contact us within 30 days for an item cost refund. required for an item cost refund upon our receipt of the item. 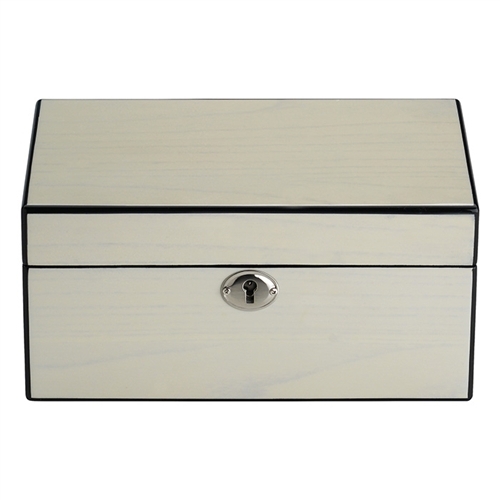 ChasingTreasure.com is an authorized dealer of all Reed & Barton jewelry boxes. Heirloom jewelry boxes by Reed and Barton are well designed and expertly crafted to meet the highest standards of quality to assure generations of enjoyment and use.Since 1824, the name Reed & Barton has been synonymous with sterling silver, silverplated and stainless steel tableware in addition to fine gifts. Those with discriminating taste turn to Reed & Barton for a wide range of well-designed and expertly crafted products. An unwavering commitment to high quality and old-world craftsmanship can be found in every piece that bears the Reed & Barton name.The company's distinguished family of brands includes Reed & Barton Handcrafted Chests, the largest flatware chest and jewelry box manufacturer in the world offering a wide selection of superb, all-hardwood flatware and jewelry chests. Reed & Barton remains steadfast in its commitment to fine design and superb craftsmanship. 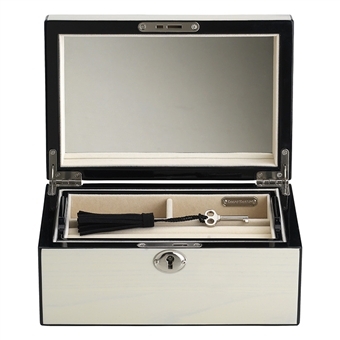 Their heirloom jewelry boxes are handcrafted to meet the highest standards of quality to assure a lifetime of enjoyment and use.